Can Citizen Journalism Make a Difference in Jordan? Ramsey Tesdell would like to bring the concept of citizen and community journalism to Jordan, an Arab country that has a long history of state-controlled media. Tesdell, 23, along with three other early 20somethings, launched the site 7iber in May as a place for “people-powered journalism,” hoping that average folks would tell the stories overlooked by mainstream media in Jordan. So far, the results have been mixed. There have been excellent commentaries on political issues, such as a rant against Jordan’s poor treatment of Iraqi refugees. But there has been little hard-nosed or eyewitness reporting from people, and only three blog posts total in the Politics section. On the plus side, there’s a nice mix of entertainment reviews, some multimedia features and a photo-stream on Flickr. Tesdell funded 7iber (which means “ink” in Arabic with “7” as the “haa” sound) himself, and so far no one is being paid. He is a Palestinian American who has lived most of his life in Iowa, getting a Technical Communication degree at Iowa State while writing for the Des Moines Register. He then studied abroad at the University of Jordan in Amman on a rotary scholarship while working for the English-language newspaper the Jordan Times. Tesdell told me he spent many summers in Jordan visiting his mother’s family, and his goal with 7iber was to tell more positive stories about Jordan for the outside world. Bloggers in Jordan have been relatively supportive of the efforts at 7iber. Some have questioned whether the site will be censoring people because it edits submissions before publishing them. Tesdell said 7iber was only editing for consistency and grammar, and might tone down any harsh criticisms of the monarchy — a crime that’s still punishable in Jordan. While Jordan has been trying to reform its government, and has privatized its media companies, there are still cases of crackdowns on dissent or critical speech. A former member of parliament was arrested for sending an open letter to Sen. Harry Reid calling the Jordanian government corrupt. Tesdell says that there’s less chance the government will be watching 7iber closely because it’s online. But if he wanted to launch a print publication to go along with the website, it would be much more difficult to get a media license from the government. There are other hurdles as well for 7iber, as it is an English-language publication in a country where mainly the rich and elite know English — making it hard to reach and motivate average Jordanians to participate on the site. Home Internet usage in Jordan is also pretty low, with about 11% of the population having access, though Tesdell says that 60 to 70 percent of people connect online at cyber cafes, work or at universities. The following is an edited transcript of email and phone conversations I’ve had with Tesdell, who talked about the way journalists self-censor in Jordan, as well as his future plans for the site. Tell me why you decided to launch 7iber and what your goals are. Ramsey Tesdell: It’s the first attempt in the region to do something of this sort. The blogging community has been growing here, and it was only a matter of time before we got together and worked collectively. All I did was plant a small seed and get a few people together. People in groups are powerful. Much more powerful than governments. There are several overall aims we’re trying to work toward. The main one is to get people here in Jordan to care about the events. They’re so used to absorbing information and accepting the government line. They’re not used to seeing something, and analyzing it with a different conclusion. We’re trying to get people involved in the process, rather than absorbing the media and news that’s produced. We’ve been working with a lot of bloggers to report on things that are happening around them. Jordan is a small country, so there are a lot of rumors that fly around, so we need to be careful not to become a rumor mill. But at the same time we want people to have a voice. How do you motivate people to get involved? A lot of citizen media sites in the States ask for people to send in stories but it’s hard to get people motivated if you’re not paying them. Tesdell: For sure. We’ve thought about that. The media [in Jordan] is fairly exclusive. If you know someone at the paper, the project or initiative you’re working on will get covered. In this way, [7iber] gives them an opportunity to cover something where they don’t need to have a connection with a newspaper. So we give them the voice to report on things that matter to them without having a connection… [or] knowing someone who knows someone. [7iber] gives them a voice, it’s something they’ve never had before. Hopefully that’s incentive enough. In time, we can develop our business model, and bring in advertising money so we can offer people a flat fee to produce things or offer some type of monetary compensation. It’s far off right now but it could develop toward that in the future. What are you thinking about for advertising? Do you see it becoming a business somewhere down the line? Tesdell: Yeah, in some ways I can see it very much becoming a money-making business, but that’s not the goal at all. The advertising works here very differently. I don’t know how to describe it [tactfully], but companies will come in — I worked for the Jordan Times here — companies will come it at 8:30 [pm] when we’re finishing pages and say, ‘I wanna full page ad.’ That will completely mess us up. We’ll cut stories, we’ll chop up stories, simply because an advertiser came in. Rather than say, ‘No we’re not going to do that,’ we just completely bend over to help them. In theory, I’d like to stay away from advertising, but it would be very difficult to say no. Our audience right now is an English-speaking audience, but also a lot of people who are in the States, so several organizations like Royal Jordanian [Airline], ours would be a perfect audience for them. Plus there are the people who started Ikbis [the video-sharing site for Jordan], they started doing a Google AdWords but for the Arab world. They have an ad network. You mentioned stories that the government is pushing and stories that weren’t being told. Can you give me an example of a story that’s not being told right now through mainstream media channels in Jordan? Tesdell: The English-language press in Jordan is strictly for the rich businessmen who come to Jordan to work. So the everyday stories, like about a community in a small village outside of Amman, they get a community center, something like that. There’s been a huge push for education [in Jordan] and it never gets covered…I wanted to create this as an alternative to the Jordan Times. The readership at the Jordan Times is about 5,000 people, which includes the King, the royal court, the embassies and the foreigners. The English-language media has a very specific and small audience. To Jordanians, it means nothing to them. There are smaller stories about education and things that impact people’s lives a lot more than these big businesses that come in and do things. Part of it is that the Arab world and Islam have a very bad and negative image in the West. Part of [our goal] is to portray a better image of that. There are lots of stories that don’t get covered in the Western press that highlight some of the positive things that Islam does. And I’m Palestinian American, and both sides of my family are Christian, so that throws people off a bit. There’s so much self-censorship when writing about the government, and it’s very difficult to feel it if you’re not part of this system. Like if a royal family member is at an event. For the event, it means nothing, they’re just there to get the event some publicity. They are there for 10 minutes, they get a photo and then they are rushed away to the next event. There’s no accountability. You hear nothing about whether the initiative really happened or not after that. We hope to fill that gap. We want to do some of the smaller stories but [also ask], ‘OK this initiative was launched two weeks ago, have they really done any of that?’ and hold them accountable. That’s one thing that’s really lacking in the press here. You were at the Jordan Times. Are there rules about what they can cover politically, or are there just unwritten rules and they self-censor? Tesdell: It’s definitely an unwritten rule. The Arabic press is watched a lot more than the English-language press. We could get away with a lot more at the Jordan Times than even at the sister publication in Arabic, Al-Rai, which means “The Opinion.” In the Arabic press they cannot say certain things that we can say in the English press. But it’s the journalists who empasize certain things because they know if they don’t then it won’t get published or it will be changed. It’s much more self-censorship. These official institutions have been around forever, and the government controls have been there. People are used to just filling out the forms and filing their stories, so [7iber] could be an opportunity to write opinions that matter to them. In Jordan, you can say almost anything you want unless you criticize the monarchy. If you don’t criticize the monarchy, you are all right. And we don’t need to do that. We can criticize many other things, like corruption in business. So other than criticizing the monarchy, are there other things you would edit out of articles or blog posts on 7iber? Tesdell: Honestly, no. If someone criticized the monarchy, we would just ask them to tone it down a bit, so that the meaning is still there, it’s still a critical voice, but it’s done in a more respectful way. Other than that, honestly, I can’t think of any other issues. The sensitive subjects would be religion and Islam, but with the English-language press, we’re not going to get that many people who are going to raise a ruckus about things like that. Things will change when it goes to Arabic. We’ll have to be careful then. Do you want to have it as bilingual site eventually? Tesdell: The goal is to portray a different view of Jordan to English-speaking audiences. And then when it gets a bit more established, we’ll use it to truly do a community journalism feel and get people to submit things in Arabic. It’s such a small portion of the population who speaks English, it’s really the elite, while most of the population speaks exclusively Arabic or French. We call it community journalism, and we want to get people involved, but until we go to Arabic, it won’t be a true community journalism effort. We’re trying as hard as we can to get as many people involved, but when we’re only working with 5 or 10 or 15 percent of the population it’s hard to call it a true community journalism site. How are you paying for everything? And what happens if you are successful, and you have a lot of traffic and are serving up a lot of multimedia, and your bandwidth costs increase? Tesdell: Right now, I’m paying for everything myself. I’m getting used to having even less money. I think we’ll each put in a ceremonial dollar, so that we each own 25% of the site in case it makes money down the line. There’s four of us right now, the core group. Other than that I just put it on my server, and I registered the domain name. I’m here [in Jordan] on a Rotary scholarship, so I took the money I made working for newspapers and magazines and put it toward the site. You mentioned only a small percentage of the population speaks English. What about Internet access? Is that still only for a small part of the population? Would you consider doing something in print to reach more people? Tesdell: The Internet penetration in homes is very low, about 5 to 8 percent. But the amount of people who use the Internet at cafes or at the university or at work is [much higher]. A large percentage of people use the Internet overall. But if we do a print publication, then we’re subject to the media laws. I asked [a knowledgeable person] specifically about what if we’re online, and they said security intelligence can’t really control you online. As long as we don’t get too crazy and too biased, they will tolerate us. If we go to print, we’d have to have a license, which is fairly difficult to get. If [7iber] becomes powerful and it makes an impact, then they might start watching us. But right now I don’t think they are watching us. What do you think about the chances of 7iber making an impact in Jordan? Will it have to be in Arabic to start becoming more of a people-powered site? Will people in Jordan contribute to a citizen media site or is it not part of the culture? Share your thoughts in the comments below. Additional research provided for this article by Jennifer Woodard Maderazo. 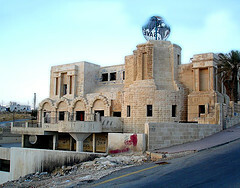 Photo of remains of Hard Rock Cafe in Amman, Jordan, by Moey Shawash. Citizen journalism can have an impact. The most recent example beyond the outcry in the media over the case of a man who “disappeared” for 9 days in one of Jordan’s hospitals, who was then found by his family in a very dismal condition (although they asked about him in that particular hospital 3 times, only to be given an answer that the man was not there). The man’s son happened to have a blog. He blogged about the ordeal and 125 people commented in 2 days. This caught the attention of a mainstream media journalist who covered the story and the matter reached the ministry of health (hopefully to be dealt with). I wish 7iber luck. But to achieve their aim, in my opinion, they need to move beyond blogging punditry to more investigative stuff, which is time consuming and thus needs some sort of financial support. Some factual corrections on the story: latest government statistics showed that a third of Jordanian households have a computer and 16% have internet access. Also: almost no one in Jordan speaks French. Wow. I thought we had it tough with Grassroots Journalism over here in the states. Kudos to Ramsey Tesdell. Mark, thanks for focusing on 7iber, which seems like a very cool project. That said, it’s certainly not the first citizen media project in Jordan – that distinction goes to Daoud Kuttab’s Ammanet, an innovative radio station that recruits citizen reporters, teaches them the basics of audio recording and editing, arms them with digital recorders and encourages them to produce journalistic programming. It’s less well know in the US, because it’s in Arabic and because the focus is solely on Jordan, but it’s a hugely relavent project in the country and the region and has inspired a great deal of new media development in Jordan. Through all the article one mat think that all the region have a media-control mechanism; by government and or by law. This is almost true. Well, Israel is an exception in the Middle East region. There is no such control at all. Through all the article one may think that all the region have a media-controlled mechanism; by government and/or by law. This is almost true. Well, Israel is an exception in the Middle East region. There is no such control at all. You are absolutely right that AmmanNet deserves sole credit for being the first to work with citizen-journalism. We met Daoud many times while crafting this idea and he offered his experience and endless insight to help and try to make 7iber successful. In no way do we mean to take credit from AmmanNet and Daoud’s dedication to the region. We can only hope that 7iber becomes half of what AmmanNet has become. Pretty good post. Any way I’ll be subscribing to your feed to konow more zoom kobe v and I hope you post again soon. Power Balance Bracelet is enjoyed by millions of people worldwide who report having experienced excellent balance, strength and flexibility when wearing the bracelet. We specialize in Power Balance Wristband for several years with good quality and competitive price. You can save money especially because Power Balance Wristband Australia Free Shipping. Nike Shox was designed for athletes who want to measure and monitor their progress toward their goals. Airandshox.com is finding the top Nike Shox shoes that fits your feet perfectly from popular brands nike shox shoes series,including Nike shox turbo,Nike shox nz shoes,Cheap nike shox sale,Nike shox r4 shoes,Nike shox womens,Black Nike shox.Airandshox.com is firmly persisted “Best Price, Best Quality, Best Punctual Delivering, And Best Satisfactory Service”.